A 24-hour period in July was infinitely more exciting than any part of this year’s NBA Finals, including cramp-gate. Lebron held the sports world hostage while we awaited his decision for the 2nd time in 4 years. Then at noon on Friday, the best basketball player in the world decided that he was returning to Cleveland, a championship starved city, and most importantly his home. The resolution on where he would “take his talents” 4 years ago was not satisfying. It was public, selfish, immature and it breeded a legion of Lebron haters. Fittingly, yesterday was everything “The Decision” was not and it made a previously polarizing superstar into one of the most popular and well-liked athletes in the country. Writing a letter as opposed to an interview and doing it on his own terms and not ESPN’s was a brilliant move. It seemed as if Lebron and his PR team have learned from their mistakes. Then the letter itself furthered that notion as it said everything that needed to be said. It was pitch perfect and there is no way anyone can criticize him for this move. 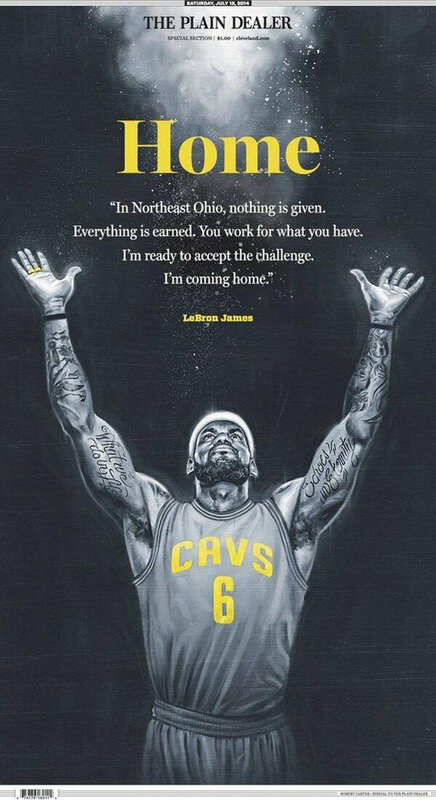 Home holds a special place in all of our hearts and A LOT had to happen for Lebron to return to Cleveland. It’s a perfect storm and the fans have embraced him yet again. Overall, it’s just a tremendous story that has to excite any sports fan. The reaction across the sports world yesterday was fantastic. It was difficult to keep up with Twitter and Cleveland sports radio was a must-listen. 1964 was a very long time ago so yesterday was a huge day for that city. The Cavs are going to be a very fun team to watch next year with lots of young talent to complement a wiser, more mature Lebron. When the news broke, I envisioned plenty of Lebron-themed “Coming Home” montages but Skylar Grey did me one better. She recorded a version of the song specifically for King James. Very cool. The Decision 2.0 is over and the sequel was much better than the original. As the rest of the pieces of the free agent puzzle fall into place, Cleveland counts down to opening night when they can officially welcome Lebron back home. Thanks to watching the Howard Stern Birthday Bash, which included some amazing performances, I’ve been really into Dave Grohl and the Foo Fighters recently. Especially his acoustic renditions of Everlong and My Hero, which he performed for Howard at the Hammerstein Ballroom. Howard did a quick interview with Dave during the show and he asked about the conception of Everlong. Of course it only took Grohl 20 minutes to write the song. From the majority of interviews that I’ve read and heard about writing a song, the great ones do not take long. The story behind the acoustic version is also fantastic with the first recorded version ever coming from an appearance on Howard Stern. Many of Grohl’s songs require some intense vocals so when Howard asked him to play something during his early 2000s appearance, he chose Everlong because it’s one of the only songs he doesn’t scream intensely throughout. The performance was flawless, giving a new take on an already great song. Howard played it multiple times throughout the morning and his audience really responded, taking the acoustic version to new heights. Grohl said that his career would not be what it is today without that appearance on Howard Stern, so for him to play at the Birthday Show was also pretty special. I wish that I could post both of the performances from the Birthday Bash but here are two other acoustic versions of two classic Foo Fighters songs. I will never tire of watching goal reactions from around the world. Some have argued that soccer is boring but when a goal is finally scored, the reactions are priceless – especially when it’s your home country. No matter where you were viewing USA’s opening World Cup match vs Ghana, when John Brooks headed home the game-winner, the place exploded. One of the best videos came from a beer garden in Portland with a reporter doing a live report when Brooks scored. Of course the place went nuts but the capper was the reporter celebrating with the fans and taking off his windbreaker to reveal a USA shirt. The combination of patriotism and steady growth soccer’s popularity over the past decade has made this the most talked about World Cup yet – at least from my perspective. Social Media is also a contributing factor and it’s pretty fantastic all around. People who had never watched a soccer game prior to this month are eagerly anticipating Sunday’s game against Portugal. The U.S. has a much better chance of advancing out of the group round after Monday’s thrilling victory. The win was also made sweeter because of the opponent and the fact that Ghana knocked us out of the last two World Cups. With that being said, Ghana dominated the time of possession, Altidore is out for the next match with a strained hamstring and Dempsey will be playing with a broken nose. We still have two very difficult match-ups left in our group in Portugal and Germany and our own coach said he doesn’t believe this team can win it all. One win doesn’t cure all but it’s a great start and it definitely helps everyone overlook those problems. They will need to be addressed at some point but going forward if we can get past Portugal (possibly playing with a banged up Ronaldo) on Sunday, we all but assure ourselves a spot in the knockout stage, which would be a huge win for American soccer. And if you think the interest is high now, wait until we get out of the group round. The World Cup has been immensely entertaining thus far and ESPN has done a fantastic job with its coverage. It’s a shame that they have to turn it over to Fox in the future – their coverage from Brazil is strongest product the worldwide leader has broadcasted in a very long time. Hopefully the overall buzz continues to trend upwards and the first game was a perfect start to attract even more. If Team USA can beat Portugal, then surely everyone will get on board and become a full-fledged soccer fan. In the time between now and Monday’s game, I’ll be watching more goal reaction videos. Thank you John Oliver! I’ve been following net neutrality for some time now and I’ve always been surprised as to how little coverage it gets. This is a vitally important topic that can drastically change our greatest information source forever. The beauty of the Internet is that you have a breadth and depth of information available to you at any time. I can have cnn.com open in one tab and this blog opened in another and I can visit them both at the same speed. Having the Internet providers control what gets the “fast track” and what doesn’t would be devastating for our free market of information. John Oliver is hilarious and he does a fantastic job here explaining how ridiculous it would be if net neutrality goes by the wayside. Someone needed to expose the hypocrisy of our Internet providers and to do so in such a funny and memorable way is the icing on the cake.